Thanks to the latest handyman apps you can find nearby handymen, plumbers, cleaners, electricians, air-conditioning technician and gardeners at a moment’s notice, compare and book their service. Sometimes it can be hard to find time to accomplish all the DIY household and garden jobs on your ever-growing list. A handyman can do a variety of small home improvement projects that save you time. Today you can use a growing number of apps to find a handyman in your area. 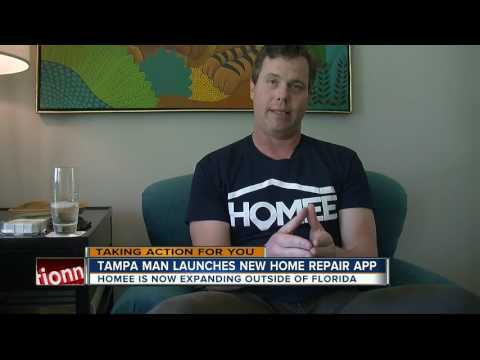 Homee on Demand is the latest handyman app in the sharing economy. It was first launched in Florida and Ohio, but is now available in seven more states and rapidly expanding. It is planned to cover the whole U.S. in the next year or two. How do handyman apps work? You simply open the app on your smartphone press the request service button, see how much they charge, check the rating and reviews before clicking to confirm the job. Finally a few miles away a licensed contractor will respond. First and for safety reasons the handymen available on the Homee find a handyman app have to run through a 10 year background check for criminal history. They are licensed and insured and proven several years of experience in the area, plus the reviews of their work are checked. If contractors get complaints they will investigate and will remove them if there are serious quality questions about their work. The best thing about this app is there’s no surge pricing. Whether it´s a weekend or at night, they’ll come out and charge you the same as they would on a Tuesday afternoon. The Homee app also offers a $1000 “get it right” guarantee, just to make sure customers are satisfied. Please have a look at our latest article on home buying apps too. Similar handyman apps like this include: Thumbtack, TAKL, Task Rabbit and Home Advisor.